What Is the Five-Fold Ministry In the Church? 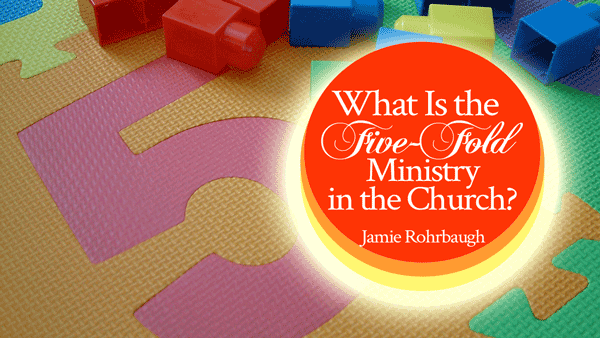 Have you ever wondered what the five-fold ministry in the church is? Apostle, prophet, evangelist, pastor, teacher … what’s it all about? Who does what? Who should do what? Who shouldn’t do what? How do they work together, and is one better than another? I felt led recently to teach a little bit about this for those who want to know more. If you’re curious, check out the YouTube video below! What are your questions about the five-fold ministry? Please leave them in the comments and I’ll do my best to answer them! What reasons would a church not be functioning as a 5-fold ministry church? Merry Christmas to ” You & Yours”!!! May The Father Continue to “Bless All that You put forth Your Hands Unto to do” thank You for that awesome teaching on the five – fold Ministering gifts. Growing up in The Africian American Church I must Say that the Five -Fold Ministering Gifts have Not always Been Displayed.However Being Called to the Office Of An Apostle, The Prophet and Teacher..I have Been Ordained to Stand and Operate in All the gifts.For Years Father God Has Used Me in Those Capacity.The Apostle is the most recent in the last three Years. I have been devouring the Word with a Hunger and purpose to Teach as well.However because There are Respects to persons..The Particuliars seem to be stuck in ” This Is How Its always been” type of Believers. People are slow to Change and will resist for the most part..When The Fathers Desire is to bring the body to maturity. I enjoy being apart of Your Ministry..I thank God For You and The Anointing He has seen for to equip you with for the edification of the Saints. As I go forth for the New Year..Please pray For Me..That I will Be obedient to Boldly Raise up the Church That The Father Has Call forth In Me…Being A Pastor In These days require strength, endurance and lots of dedication to God and man.Despite it All. Again Thank You..Know That You are “Grately Loved And Appricated From My Little old Rual Side of North Carolina. On The Road To The White House. Hi Jamie your prophetic words about gods going to dethrone Queen Vashti really uplifted me thank you lv Myra. Hi, Jamie, wonderful teaching! What I am struggling with right now is that my church is growing by leaps and bounds which is great! Don’t get me wrong, I love that we have new believers every Sunday. Over the services at Christmas, there 959 decisions for Christ! BUT my deep concern is that there is no function in the church to teach these babies! It is an area that I have a passion for and I don’t know what to do about it. There is no Sunday School; just small groups. These small groups are mostly about interests so that members can get to know each other. God was so good to me that when I joined my first small group, the couple who hosted it were mature Christians and I learned so much from them and have since been doing my own studies at home. But they also expressed a concern that the baby believers were not being fed. I personally know what can happen to a new believer and it’s scary! The leader of our church is definitely an evangelist – that is where his heart is. I love that about him but there is just nothing for the new believer. Is God calling me to do something here? I have been praying about this. By the way, our church has a membership of almost 5000 people so I know that reaching new believers would be a challenge. I am not unaware of that. Anyway, I would appreciate your input about this. God bless your ministry!